A nice looking gaming table needs nice looking trees. I have used different kinds of pre-made trees -and most of them are perfectly fine- however, nowadays I like to make my own. Since the godfather of modellers in our region, grandmaster Oakleaf taught me how to manufacture great looking trees in a most swift and cost-effective way there has been very little need to buy them anymore. In the following pictures I’ll show you how to make a larger tree of approx 12 cm that is suitable for a Flames of War table, and a smaller one of 3 cm that one can use on an FoW infantry or gun stand. Here’s how it’s done. Very basic stuff you can find anywhere. Depending on how big trees you are about to make, cut some welding wire into a length of about 2,5-3 times longer than the intended length of the tree. Bend the wire from the middle leaving a loop at the end. The result should look a little like a needle with two shafts. Then take some sisal string pieces and break them apart. You need about 1 sisal piece per a centimetre of the tree. A bit less if the tree is longer than 6 cm. Place the sisal fibres between the shafts of the welding wire you have bent. Attach the sturdy metal hook to your drill. The fibres are set between the shafts and the hook is attached to the drill. Insert the pointy ends of the welding wire shafts between the jaws of a vise making sure the sisal fibres don’t fall out. Tighten the vise. 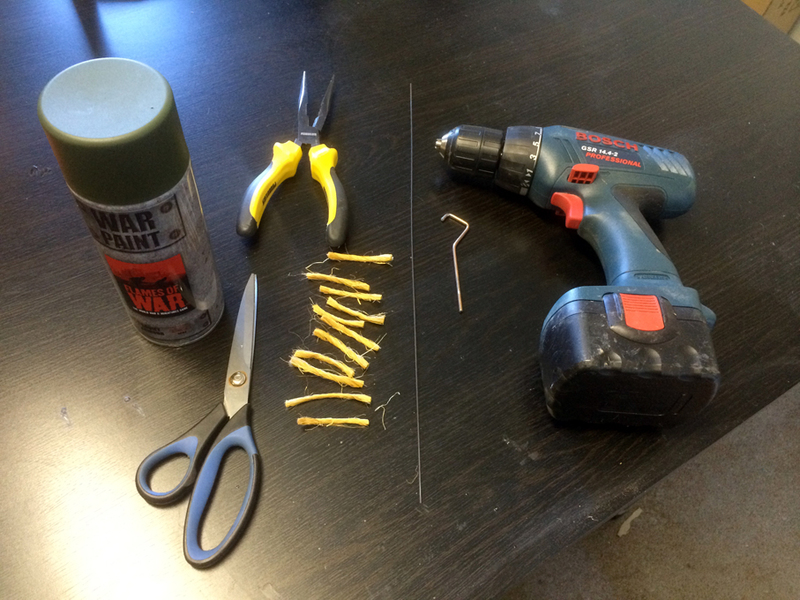 Grab the loop of the welding wire with your drill hook. Fire away! Wind the welding wire and the sisal fibres into a tight spiral. Avoid using too many rpm. Slow and sure is the key here. 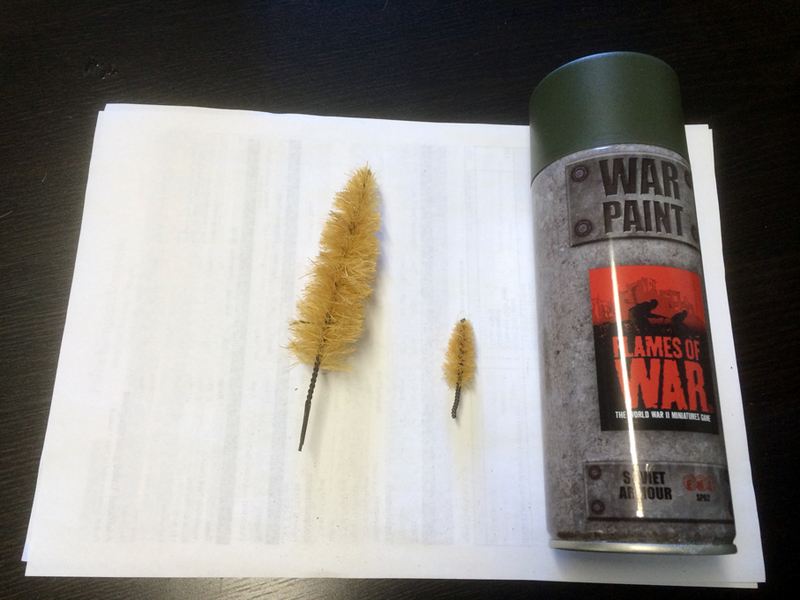 The result should look like a short version of a bottle brush. Bottle brushes of different sizes! Cut the fibres into a tree-like shape and cut the excess wire from the top side. Paint the tree with green spray. Ready. The smaller tree was dipped into flock after painting while the taller one was left with a plaint coat of paint. Before attaching the trees, cut the lower end of the trunk into a suitable length, and voilá! 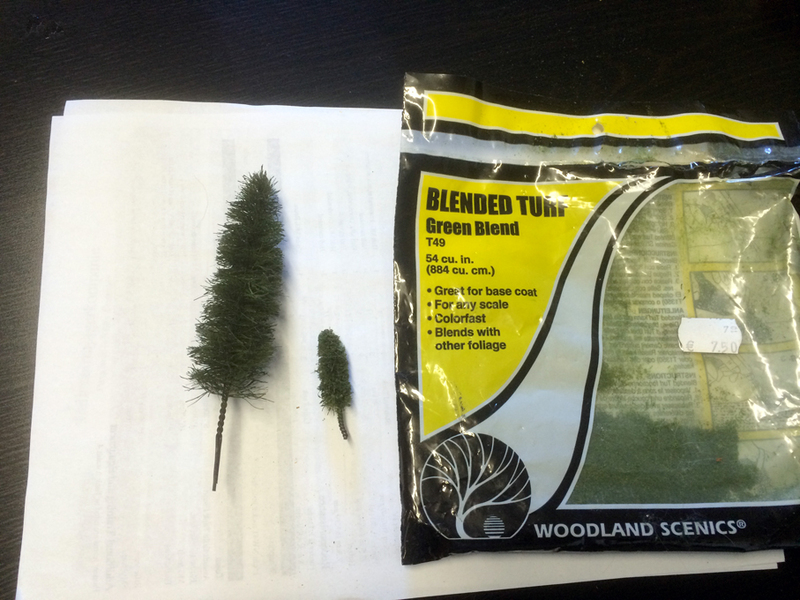 Additional tips: For a more realistic look one can drybrush the tree with a lighter shade of green, but most of the time the plain spray works just fine. For a slightly different look I like to dip the tree lightly into some green flock while the paint is still wet. Brush off the excess flock with an old toothbrush. No need to be too gentle here. Nice and simple, any easy way for western Europe trees? How do you base the trees?